Whilst FIH is no longer recommending beep test at their tournament, your local tournament may conduct such test to gauge on field hockey Umpire(s) fitness level. Pre-hydration: It is recommended that umpires pre-hydrate the night before or early in the day far enough in advance of the test, so that when running the beep test, they are relying on the stored water in their bodies. A quick measure of one’s hydration is to check for a very weak colour (or no colour) in their urine. 500mls – 1L of water 2-3 hours before training, allowing for some of it to void out. Adequate rest: Often an area in training that umpires ignore is adequate rest for their body! Dr. Samuels, University of Calgary Centre for Sleep and Human Performance advocates that adolescents need 9-10 hours per night to be adequately rested and recovered from training. Umpires should aim for regular, structured and consistent amounts of sleep for best performance. Aim to go to bed at the same time each night for the same length of sleep. Fruits like bananas, orange, apples, dried fruit, fruit juices, fruit bars etc. Dried cereals, low fat granola bar, fig newtons, low fat oatmeal cookie etc. The key is not to consume volumes of food, rather an adequate amount to hold you over until the test is complete. The more important meal is what you ate the day before! Footwear and clothing: Umpires are encouraged to wear suitable footwear for the surface they will be running on. I.e Turf shoes on Astro Turf Pitch. Wearing running shoes on the turf may cause an umpire to slip on the pivot step, depending on the weather &/or surface condition. Clothing should be comfortable and suitable for either inside or outside running, depending where the umpire will be performing the test. 20M multi-stage shuttle run. Umpires run “in time” with the beeps between levels on the Audio disc/tape. An Umpire must reach the line with their foot either on or over the line in order for that shuttle to count. An umpire should remove themselves from the test at a point if they are feeling weak, faint or dizzy. Download the Beep test MP3 Audio from the link below and follow the diagram to set your appropriate training level target. If you’re going for a tournament, you may want to contact your national body / FIH to confirm on your fitness test as it may be totally different on what I’ve shared here. 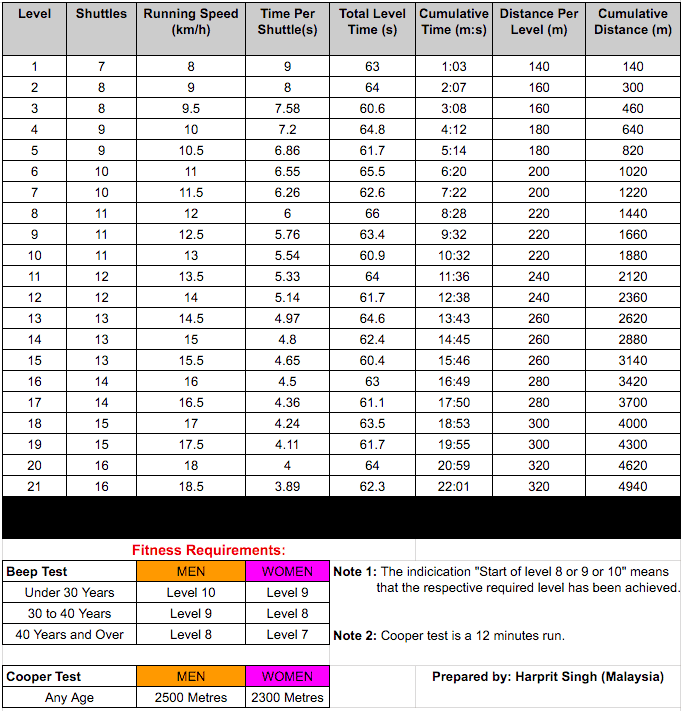 Beep Test Audio Level 1-21 Download. If you can’t download, please right click on the link and choose Save Link As OR if you’re on a mobile device, tap and hold on the link, choose Save link to download. Note: Whilst it is not recommended, you can also train on a treadmill and adjust the running speed accordingly to the level below. Aim to pivot on the line in time with the beep. Use regular, deep breathing early in the test, so that it becomes automatic when the going gets tough. Arms should be used to assist in the movement of the legs, as the umpire becomes fatigued during the latter part of the test. Lactic acid will build up in the leg muscles, so our arms can assist us through the final stages. Upon completion of the test, umpires are encouraged to keep moving around. Do not sit down right away! You need to keep the blood flowing through the muscles and a proper cool down is necessary after completing the test. Use your heart rate as a guide. The BPM should drop significantly within the next 3 minutes after the test. If it does not slow down right away, allow a longer cool down. Honestly, I am not the fittest or slimmest umpire among my local peers but I usually follow this training at least 4 weeks prior to the actual test and it has been fruitful for me. In addition to this, I also play Hockey & Futsal regularly to keep me going. You may need to mix up your training programme as preparing for beep test alone before a tournament can be stressful sometimes. Look at the video below on what Jean Duncan, the Umpire’s manager for the Hockey world league thinks about the importance of an umpire fitness. I would also like to thank and credit Carolyn Gillespie, FHBC Regional Coach, Pinnacle Sports Physiotherapy, Kelowna, B.C. for sharing his information online & tips in this article. Disclaimer: Please note this article is created merely to share information on how an umpire can train themselves to improve their fitness level. At no time should an umpire be using the beep test audio, diagram or any information provided here to train for the actual test as it may differ from your local/national body standards.